They saw each other, they smelled each other, and since then it’s been crazy love. As the perfect combination of la Carpe Haute and Poulpe Production, Morgan Mansouri, Cédric Marschal, Gael Perry and Dan Seyfried are four French friends. Coming from the Far East AND the Far West of France, they met abroad a couple of years ago and decided to create a show that is like them: speechless, noisy, with glasses and beards. 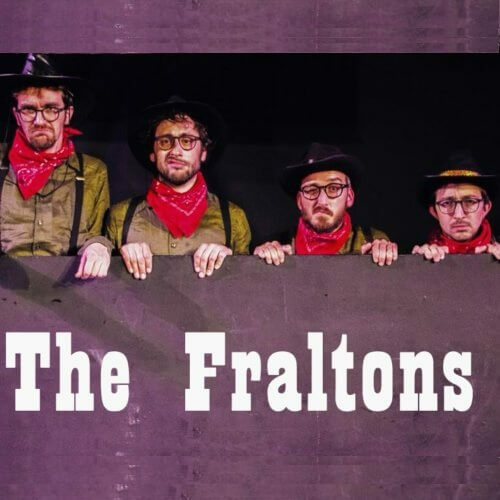 Inspired by the famous bandits from the comics “Lucky Luke”, the Fraltons are the improvised version of the French Daltons.